The E5 is a promising idea, delivering decent, hassle-free surround sound in rooms where normal surround sound systems aren't practical. It isn't cheap, though, and its status lights are distracting. Philips is gunning for the home cinema space and not just in vision. 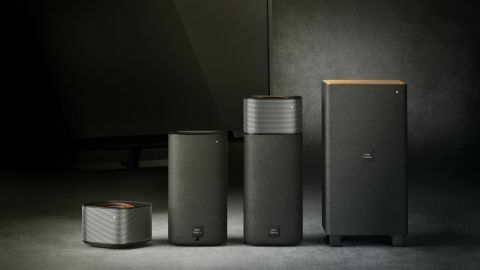 At this year's IFA the company had a range of updates for its Fidelio range of speakers, one of the highlights of which was the Fidelio E5. Investing in surround sound can be a bit of a faff for a lot of people but Philips now has a way of making things a lot easier - and the idea isn't even that crazy. The Fidelio E5 consists of two sound towers designed to stand either side of your TV, along with a separate subwoofer. But the USP of the 2.1 sound system lies in its ability to be amputated. Take the top parts off the towers and you now have four independent speakers to create your own surround sound. The top two satellites are wireless and designed to be placed elsewhere (pretty much wherever the heck you like) to get that full Dolby Digital experience. The range on these detachables is 15-20 meters, which should be more than enough for most living rooms. Any larger than that and chances are you'll be after some beefier speakers anyway. While a fair bit bulkier, the subwoofer is wireless (and subtle in design) so you'll also be able to place that wherever you see fit. Both detachables have separate drivers to the towers and boast 10 hours of battery life, which should see you through that Lord of the Rings marathon. We're also told they take four hours to recharge when reunited with their other half. In terms of connections, you've got dual HDMI ports with Audio Return Channel support, aptX Bluetooth and the option to pair your phone or tablet via NFC. All sounds good, but the real exam is in the test. We experienced the E5 with an excerpt from Transformers: Dark of the Moon, and testing the satellites behind us we found the audio quality remained high when traveled across the room, despite their size. However this was in a controlled environment so we'll have to wait until our full review before we can really put this to the test. We also quite like the design of the speakers themselves, particularly the satellites' leather handles, but there's still an inconsistency between the two parts. It's not a huge deal however there's also an always-on (though dimmable) LED that lights up on each speaker when fully formed. Could prove to be a tad distracting in the dark. The E5 is a neat idea - there's definitely appeal in having the option of decent, hassle-free surround sound when you're in the mood for a film. This will especially be the case for those whose living room layouts can't afford something more comprehensive. The E5 is going on sale for €699 in Europe in the coming months so keep your eyes out for our full review soon.